(MoneyWatch) Congress returns to work after a five-week vacation and before the election. While it is unlikely that lawmakers will tackle the so-called "fiscal cliff," it will be discussed frequently. Here to help you out is a summary of the fiscal cliff and how it might affect you. Which taxes are going up? The Bush-era tax cuts are set to expire, which will bring the tax system back to 2001 levels; President Obama's 2 percent payroll tax cut holiday will expire, and a series of other temporary tax cuts for businesses that Obama enacted will end, including: the enhanced dependent care credit, enhanced child credit, enhanced adoption credit, a portion of the enhanced earned-income credit (the temporary increase of the credit for families with three or more children, and the temporary increase in income limits required to qualify for the credit are both due to expire in 2013), repeal of personal exemption phase-out, repeal of limit on itemized deductions, enhanced student loan interest deduction; and the exemption for mortgage debt forgiveness. Additionally, the following tax cuts have already expired, but they are up for renewal in 2013: AMT adjustment, deduction for state and local sales taxes, IRA charitable donation provision for taxpayers 70 1/2 and older and Educator's classroom deduction. How did the spending cuts come about? One outcome of the August, 2011 debt ceiling debacle was the creation of the Joint Committee on Deficit Reduction (aka "the supercommittee"), a bipartisan committee charged with finding a way to slash the nation's government spending by $1.2 trillion over the next ten years. While most Congressional committees can be toothless, the supecommittee had a big incentive to come up with a plan: If they could NOT come to an agreement, there would be a trigger - an automatic $1.2 trillion in spending cuts would occur-half from domestic spending (see next question for what would be spared) and the other half from the Pentagon. When the supercommittee failed to reach an agreement last year, the automatic spending cuts became a fait accompli and the first $110 billion in automatic cuts will start Jan. 2, 2013. Will everyone's taxes rise? It's estimated that 80 percent of Americans will see some form of tax increase next year. The Bush tax cuts alone would impact 100 million Americans. The Tax Policy Center estimates that the average U.S. household would face an average of a $3,500 jump in taxes and the average middle-income earner will pay $2,000. One of the biggest losses for low to middle wage earners will be the Earned Income Tax Credit, which was a refundable credit (meaning that even if your credit exceeds your tax liability, you don't lose the excess and are entitled to receive any overage as a refund) for married couples filing jointly with 2011 earned income under $49,078 and singles with income under $43,998. On top of the EIC, the expiration of the "payroll tax holiday," a 2 percent Social Security tax cut on the first $110,000 in wages, will mean a tax hike of $1,000 per year. Add in the old tax rates that will go back into effect after the expiration of the Bush tax cuts, as well as tax and college credits, and you can see how tax bills for middle and lower taxpayers can pile up. High taxpayers will be hit with the Bush era tax rate changes. The two top tax brackets are set to rise from 33 and 35 percent to 36 and 39.6 percent respectively. Additionally, the capital gains and dividend tax rates will rise. The current capital gains rate of 15 percent will increase to 20 percent, while the 15 percent dividend tax rate will equal income tax rates. The estate tax is also set to increase. Right now, each tax payer is entitled to a tax credit that wipes out the estate tax due on the first $5 million of an estate. The tax rate above the $5 million threshold is 35 percent. When the Bush tax cuts expire, the exemption will drop to $1 million and the tax rate will increase to 55 percent. Where will the spending cuts occur? The cuts will occur in the Defense Department, which will see percent across the board cuts, and "discretionary" programs, or those that don't have earmarked funds, which will absorb 8 percent cuts. That means that there could be cuts in everything from infrastructure to schools, to public health and homeland security. Will Medicare be cut? Yes, the government-run health care program for seniors would face a 2 percent cut in Medicare payments to providers and insurance plans, which amounts to a reduction of $11 billion next year. What programs will NOT be cut? Social Security, Medicaid, supplemental security income, refundable tax credits, the children's health insurance program, the food stamp program and veterans' benefits. The White House has also said military personnel would be exempt from the cuts. How would the fiscal cliff affect the deficit? The CBO estimates that the combination would shrink projected deficits from $1.13 trillion in the fiscal year ending Sept. 30 to $641 billion for the year that ends Sept. 30. That amounts to a reduction in the deficit as a percentage of GDP from 7.3 percent to 4 percent. 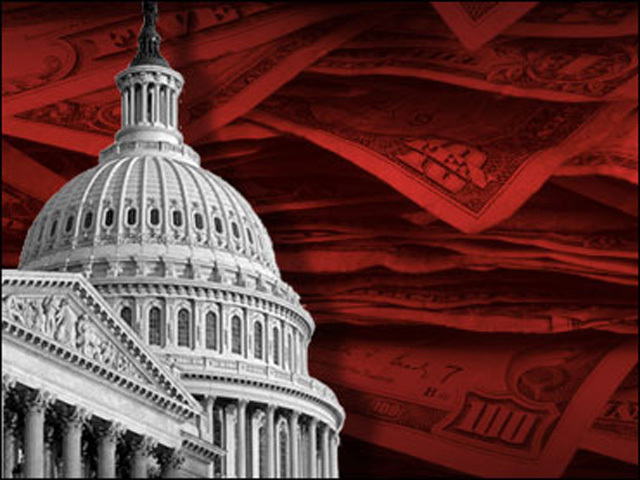 What if Congress delays the fiscal cliff? If most of the tax cuts are extended and mandatory spending cuts are delayed, the deficit would shrink to 6.5 percent of GDP, though the country would like face a fifth consecutive year with a budget deficit in excess of $1 trillion ($1.037 trillion). Unemployment would likely remain near 8 percent and the economy would expand by 1.7 percent. Where do the parties stand? Republicans want to make the Bush tax cuts permanent and concentrate spending cuts in Medicare, Medicaid and discretionary areas. Democrats argue for increasing taxes on Americans who earn more than $250,000 in combination with spending cuts. Currently, groups of lawmakers are trying to come up with a compromise, but most believe that a near-term deal is a long shot. Is there a chance for compromise AFTER the election, when the lame duck Congress is in session? With less than two months to strike a grand bargain, it seems unlikely. But lawmakers could create a temporary deal that would at least put a fence up near the cliff by Jan. 1.